The kid's bedrooms are two rooms in the house that I've been dying to get finished for ages, but I haven't struck just the right inspiration yet, and furniture has been hard to come by as well. When Jay finally transitioned from a crib to a bed a year ago (yes at age 3 1/2), I scrambled to get a bed for him last minute, and I have a bit of buyers remorse now if we're being honest. Over the last year or so I've really adopted a taste for modern decor, especially in the kid's spaces, and the bed we bought for him is big, black, and bulky, which has been hard to fit into this modern design that I was going for. I recently found this bed frame last night though, and I'm pretty sure I can sell his bed for the same price, and make it an even trade. Another thing that has been hard to come by are dressers. For one thing, most dressers are way out of our price range, and it felt like if we did find one that we could afford, the style wasn't there for me, and so I never felt good about purchasing it. I originally wanted to get the 1/2 Hermes Dresser from Ikea, but they only make the full size 6-drawer one now, and those are much too large for both of the kid's bedrooms. Then the other night I was on Wayfair.com (not sponsored, but I did buy all our master bedroom furniture from them... I also have master bedroom design regret, but that's a post for another time...) and I saw that their selection of dressers has really improved the last few months, so I thought I'd share with you which ones I'm loving and why. But before we get into that I need to let you know what I was looking for in a dresser. I wanted something that was short and accessible for the children. I realize that as they get older this means that the dressers we get now, likely won't be a permanent solution for them as they grow, but I'd rather have dressers that are smaller and function for them now, than ones that are super tall, and have them not be able to reach their things inside them. So without further ado, lets look at some dressers. 1. 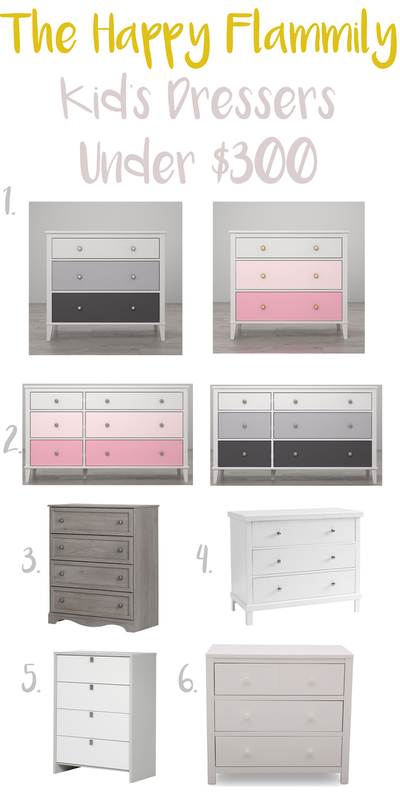 Monarch Hill 3 Drawer Dresser: The pink and black versions of these are both my favorite contenders right now for Jay and Em's rooms. They're fun and modern, and they only have three drawers which means Jay can get into everything with no problem. Their dressers right now are just three drawer Rubbermaid bins that we bought at Walmart, so we know the three drawer system works for us, and these come in at $169, so they're the cheapest of all the options. 2. Monarch Hill 6 Drawer Dresser: These are obviously the same as the three drawer, just bigger. My only issue with these dressers is that Jay and Em's rooms don't seem to have an available long wall for them to go against. I like that these are bigger, which means we can store more in them as the kids, and their clothes get bigger, but I'm not sure how they'd work in our rooms just yet. These come in at $264. 3. Savannah 4 Drawer Chest: I love birch colored wood lately, and it's very easy to incorporate into modern design. This is the cheapest, and cutest birch dresser I could find, and at $190, it's a pretty great deal. I only worry that with a 4 drawer dresser, Jay won't be able to reach the things on top of it, or in the top drawer, and I always want the things that are in the kid's rooms to be accessible to them. 4. Payson Studios 3 Drawer Dresser: I love this dresser because it's a pretty good nod to the Hermes one that I wanted to get at Ikea. It's white, has clean lines, and I even love the knobs on it. It's a little more pricey, coming in at $242, and I think that this one would probably only work well in Em's room, and not Jay's... but hey, their rooms don't need matching dressers. 5. Cookie 4 Drawer Chest: I don't know why this dresser is named "cookie", but it's one of my favorites on the list! I love the grey and white contrast, and how modern it is! The only thing I struggle with is that it doesn't really scream, "kid's bedroom". It's only $185 which certainly makes it one of the cheaper ones on the list, but I'd love to figure out where in our house we'd even put it! 6. Louisa 3 Drawer Dresser: When I was making the collage picture, I couldn't remember why I liked this dresser, and then I clicked on the link and remembered that they make it in grey, which I love for Jay's room. It's similar in shape and structure to #4, but just a little more masculine for a little boy's room! It's priced at $269 though, which makes it the most expensive on this list.